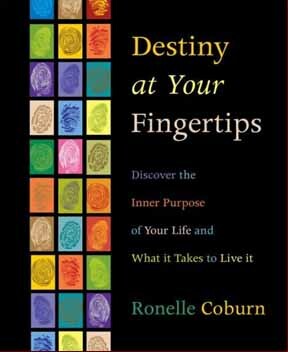 Ronelle Coburn (USA) presents: 'Destiny at your Fingertips: Discover the Inner Purpose of Your Life and What it Takes to Live it'. Ronelle Coburn did not expect to become a Life Purpose Fingerprint Analyst. She ended-up studying the LifePrints system, at Richard Unger's International Institute of Hand Analysis, where she became a faculty and executive committee member. Ronelle feels fortunate to have gone places and met people she would never otherwise have come into contact with. From exotic dancers to corporate heads to spiritual seekers, Ronelle loves working with people in their common human struggle to find a meaningful life in a bewildering world. In addition to seeing clients for individual consultation. She leads life purpose workshops and trains others in hand analysis as well as being a popular exhibitor at conferences and a dynamic public speaker. Do you know what you are meant to do? What if your life purpose was written in the loops and whorls of your fingerprints? Transcending enneagrams, the Myers-Briggs Type Indicator, and other personality tests, fingerprints tell the story of your soul's psychology. Master hand analyst Ronelle Coburn offers an easy, objective tool - fingerprint analysis - to discover your most authentic self. Are you a born leader, a healer, an artist, or a mentor? Are you destined to pursue your individual passions or nurture others? In five easy steps, you can decode your fingerprints and understand your skills and strengths on the level of your soul. Going beyond personal beliefs and goals, this knowledge clarifies how to reach your full potential in a career, relationships, and every aspect of life. Coburn describes each life purpose in depth and explains how they can best work together. You'll also find advice for coping with the internal struggles and external challenges of each life purpose.